In the 4.0 release, we plan to overhaul the variable editor. This has been one of our top User Voice suggestions and thanks to all our users who provided ideas on how to improve the variable editor. Ability to enter multiple values to a scope when adding a variable. 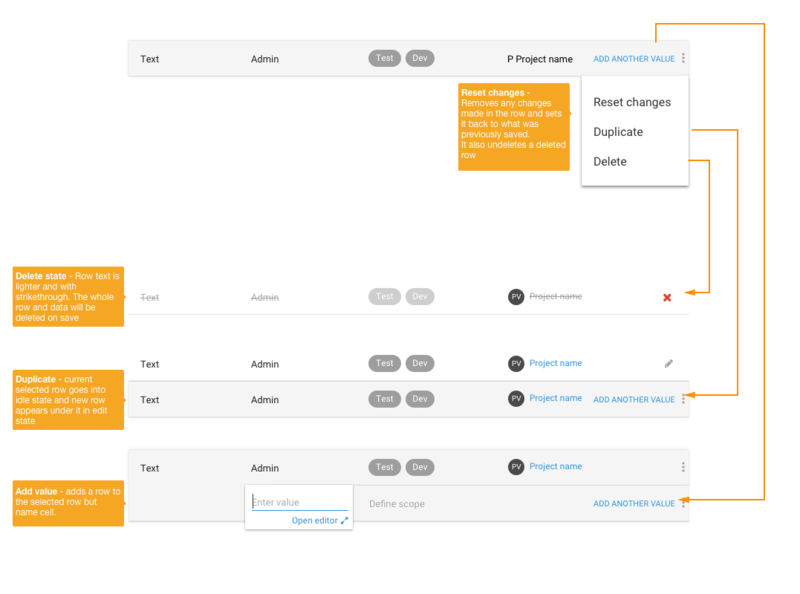 We have focused on providing a solution for four user scenarios for the first release. These cover the common themes from the Octopus team and our user's suggestions. A user is inputting hundreds of single text variables scoped to one or two environments. They need to do this quickly all by using the keyboard. A user has large amounts of code to add as a variable and needs to copy and paste it into a large text field. They have been asked to give each variable a description and scope it to tenant tag sets. A user has been given a list of usernames and passwords for each environment. 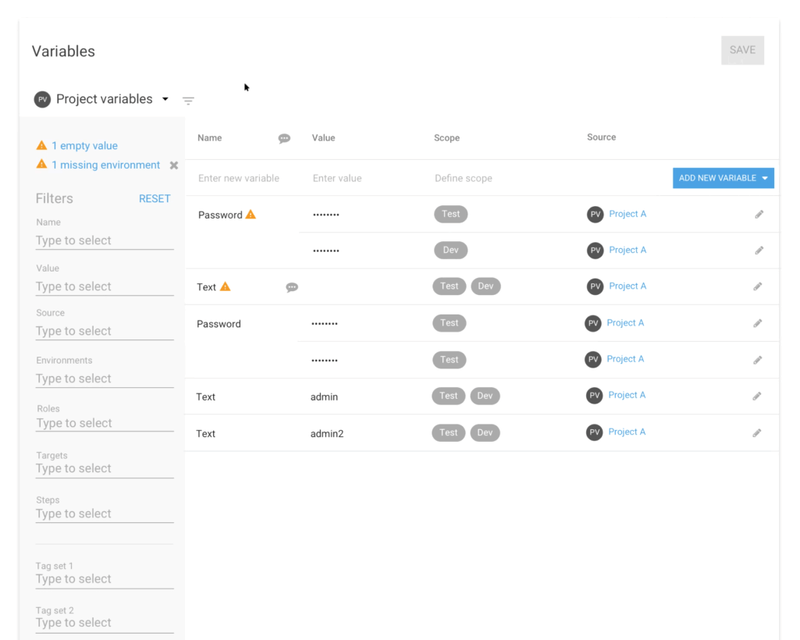 Rather than adding each value one at a time and scoping them individually, the user wants to be able to select the environment first and add multiple values to that environment. A user wants to see what values have been scoped to a particular scope configuration to see if there are any duplicates. Note There were some great additional feature suggestions too. 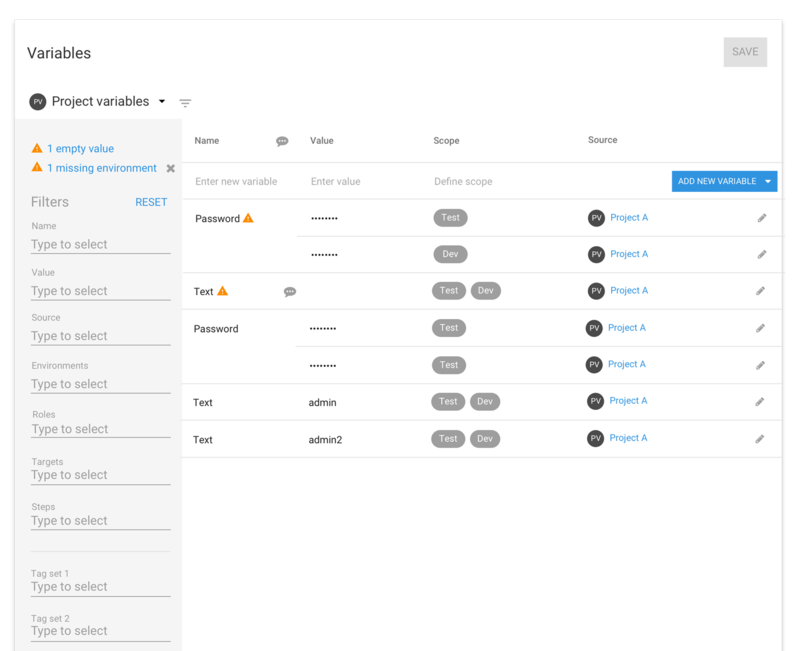 But we can’t include them all at once as we want the first release of the variable editor to focus on improving basic usability and create a solid platform for more advanced features. 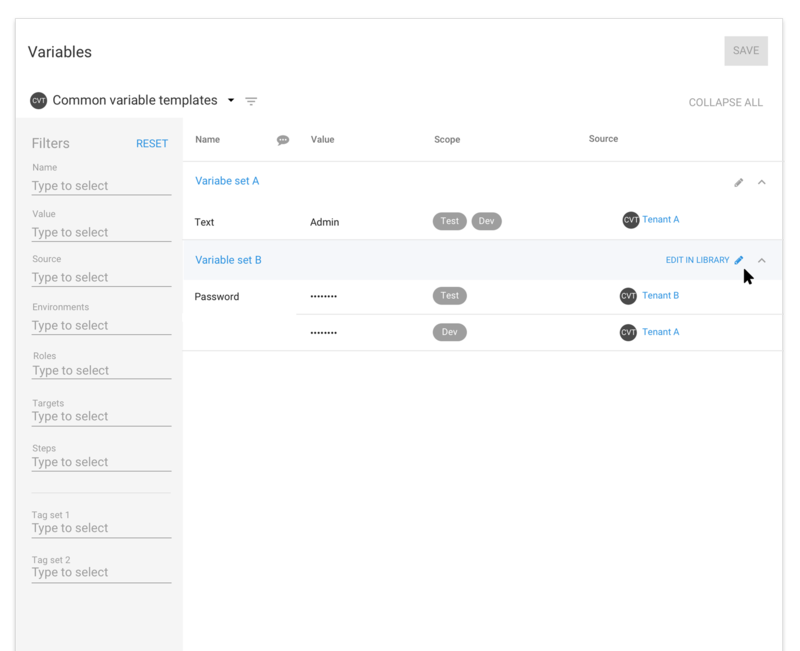 The variable editor will inherit the new 4.0 UI and maintain high-level concepts like switching between variable types, ability to filter, and view only library variable sets and common templates which are only editable in the Library. Source icons help distinguish between the variable types. The current variable editor table has the new variable row at the bottom of the table. Many users have can have lots of entries which causes this empty row to appear off the screen. We have moved the empty add row to the top of the table to make adding a variable quick and easy, no matter how many variables you have. 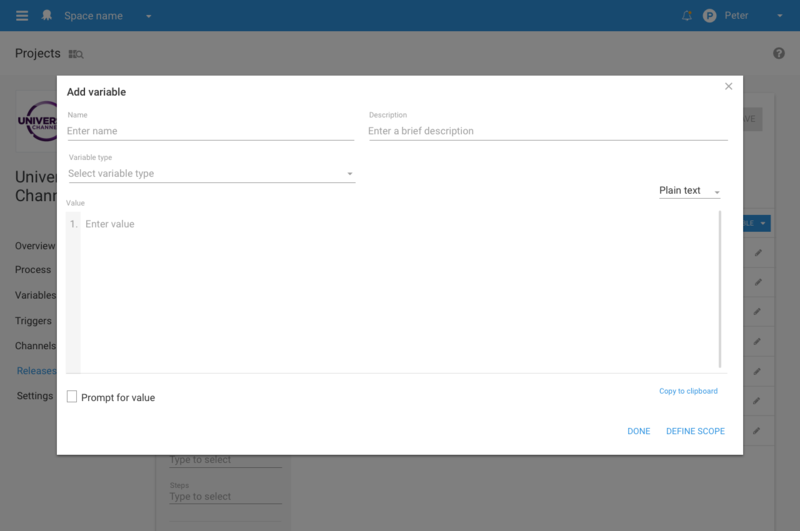 You can click in the name cell to start adding a value or click the “Add new variable button” to create a new row. The video below shows adding new variable. 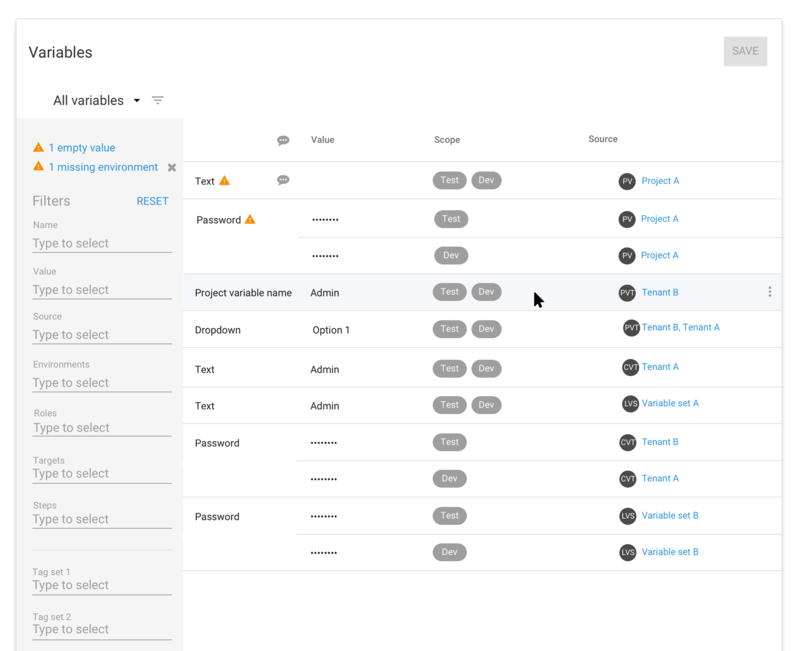 We are planning to include the ability to add multiple values to a scope of environments, roles, targets, steps or tenant tag sets. 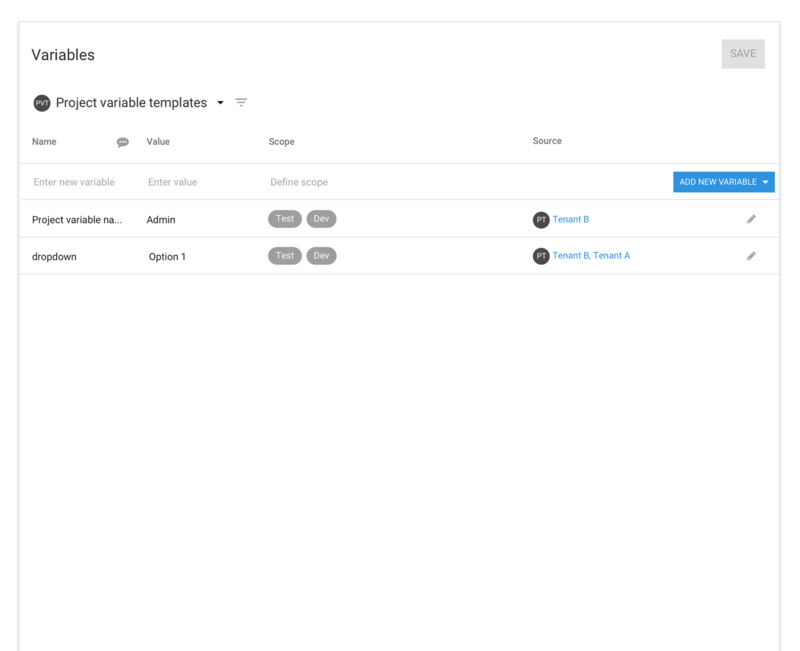 This new function will make it easier to add a set of variables for a new environment or a new role. This action would appear as a dropdown on the add new variable button as “Add multiple values”. The adding experience will take place in the popup editor with the user defining the scope first then adding multiple values. 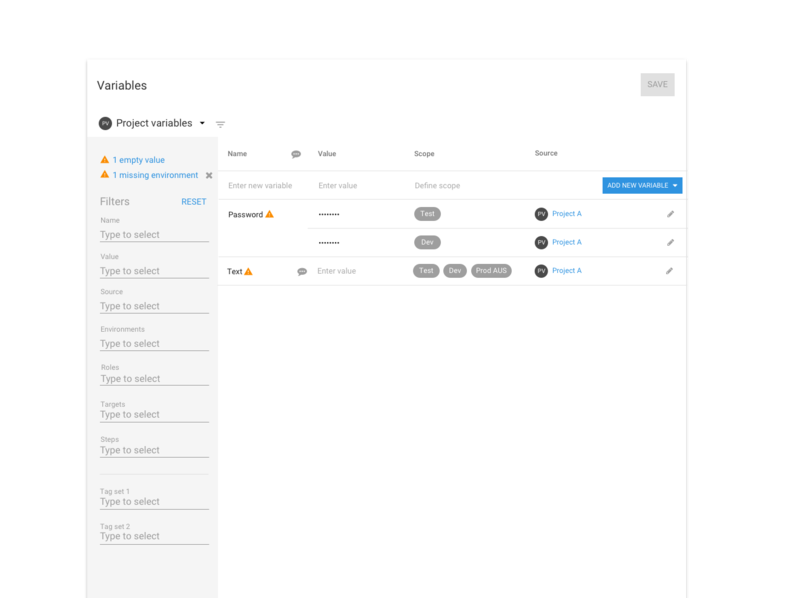 Our goal for the new variable editor is for it to be a seamless table editing experience for users who input simple variables with minimal scope. We want to make sure a user can navigate the table by keyboard only, with the option to use the mouse. The following are convention keyboard controls and shortcuts we are planning to use. 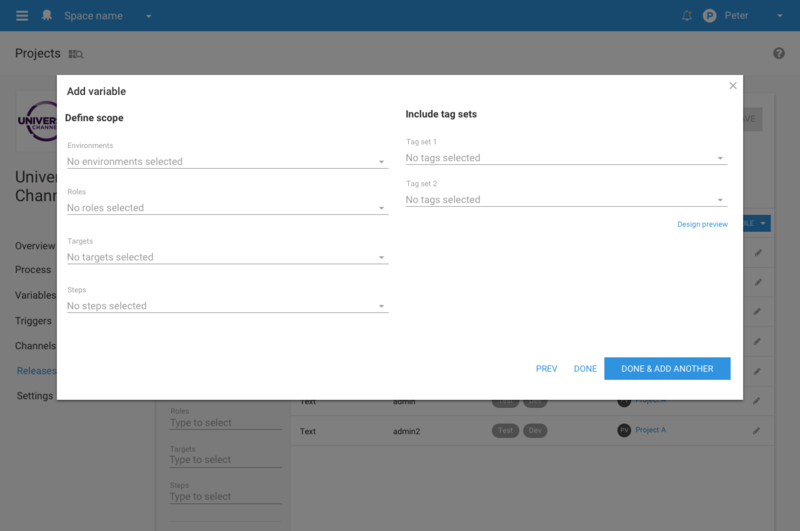 Row actions will appear on hover as an overflow menu at the end of a row. This will replace the current right click function on the first cell. The popup editor is used to show advanced options and larger text fields for adding or editing variables. The popup editor can be opened at any time when editing an existing variable. We want to make sure that if a user is only using the keyboard to enter variables that the popup is still accessible via a link and a keyboard shortcut (ctl+o). The same keyboard commands are used to navigate through the popup editor as the table editor. As part of 4.0 we want to take full advantage of the progress the Web has made since our last redesign in 2013. This means that Octopus 4.0 will only support Internet Explorer (IE) 11 and up. 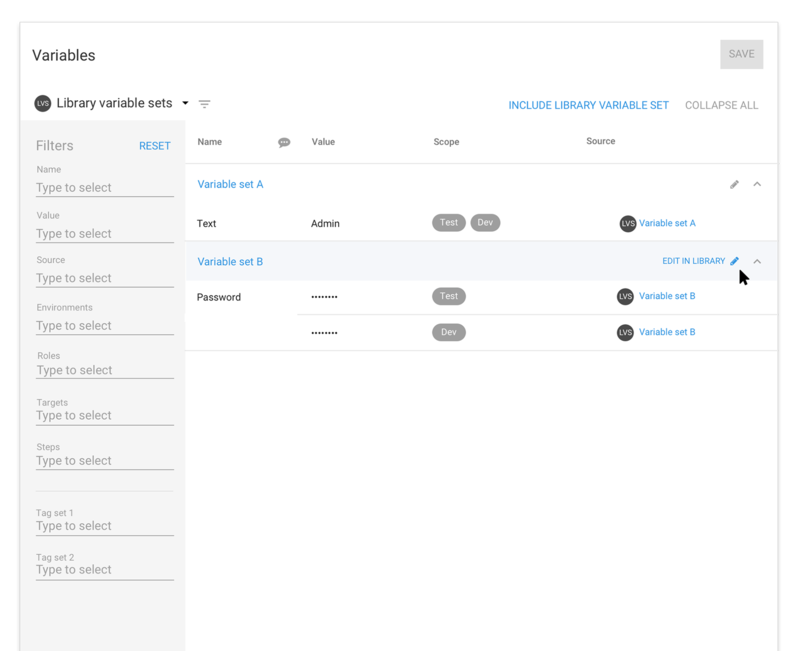 The 4.0 re-write will also improve the performance, allowing large amounts of data to be loaded and filtered quickly. Please read our GitHub issue for more information on Octopus 4.0 browser support. We think what we have outlined above will improve the way we add variables and provide a better platform for us to add more advanced features to the editor. 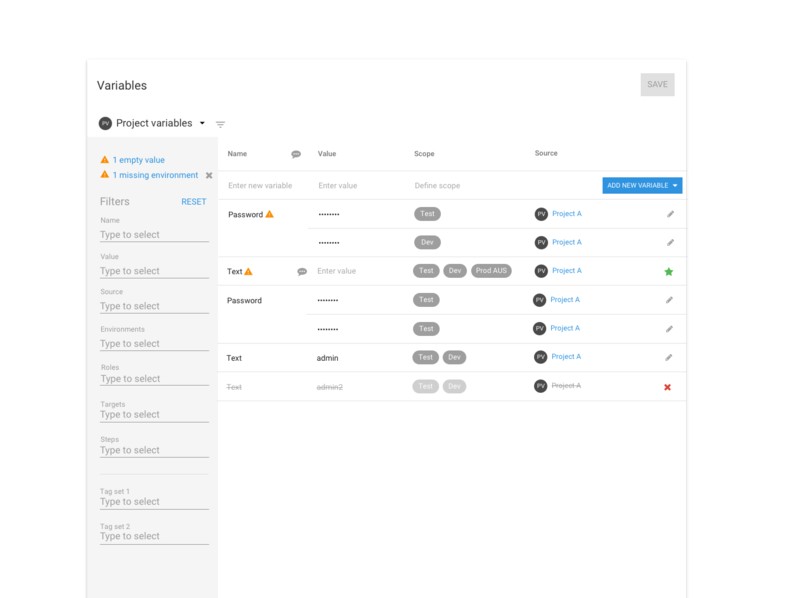 We'd love to hear your feedback on the plans for the release of the variable editor. What we'd like to ask is that if you just want to provide some quick feedback then do that below in the comments. If there's something bigger that warrants a more detailed conversation please raise an issue over on our GitHub SPEC repo Variable Editor Redesign SPEC repo.